NJA successfully lobbied a resolution to the 1982 General Assembly of the Council of Jewish Federations (CJF), for the passage of a multi-lateral nuclear arms freeze. The CJF resolution had powerful effects in the larger Jewish community, prompting other major Jewish organizations, including the American Jewish Congress, B’nai Brith and the National Jewish Community Relations Council, to issue similar statements. Arthur Waskow formed another Jewish organization, The Shalom Center, in 1983 to focus on peace and anti-nuclear activism from a Jewish perspective. In our 2004 interview, Jeffery Dekro (an early leader in both NJA and the Shalom Center) reflected that Shalom Center’s formation was at least in part due to the fact that NJA couldn’t receive full funding to do the disarmament work because of their high profile and controversial work on Israel. In 1981, observance of Tisha B’Av (a Jewish holiday which solemnly marks the destruction of the first Temple) coincided with the anniversary of the atomic-bombing of Nagasaki by the U.S. during WWII. In Seasons of our Joy, Arthur Waskow remembers that “the occasion was marked by a sizeable number of Jews who undertook a traditional observance of Tisha B’Av while being present near the White House and the Soviet Embassy – buildings symbolic of the nuclear super-powers” thus marking the shared symbolism of the potential danger of world-destruction. 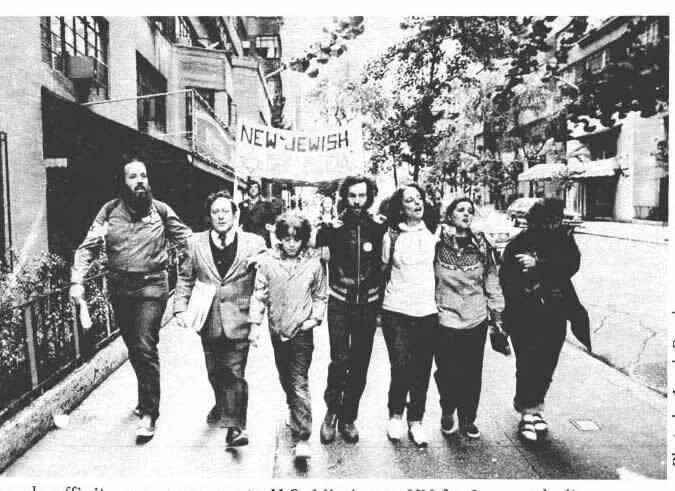 In 1984, Agenda chapters sponsored scores of Sukkat Shalom (Shelter of Peace) and Rainbow Sign celebrations, linking traditional Jewish observances with the call for nuclear disarmament. NJA also joined eight other national Jewish organizations in building a sukkah in Lafayette Park across from the White House in order to draw attention to their anti-nuclear organizing. NJA joined with a total of 500 Jews marching in the June 12, 1982 Disarmament Rally in New York – at that time the largest Disarmament Rally in American history. In 1985, NJA brought a large delegation to the Mobilization for Justice and Peace in Washington, DC. In 1986, NJA co-sponsored the Boston University conference “Judaism, War and the Nuclear Arms Race.” Other sponsors included Shalom Center, Jewish Peace Fellowship and also more mainstream groups such as the American Jewish Congress, Hillel Council, UAHC, NCJW, the Federation of Reconstructionist Synagogues and the Federation of Reform Synagogues. Following a 1986 Shalom Center Training Institute for disarmament activists, taskforce members became increasingly interested in making connections between disarmament and human rights issues, especially as applied to solidarity with Soviet Jewry, including participation in a demonstration on the Mall in Washington in December 1987, on the eve of a Reagan-Gorbachev summit. At the time, Soviet Jews were facing anti-Semitism and political repression in Russia and were struggling to emigrate in large numbers to the U.S. and Israel. “Agenda affinity group on the way to US Mission to UN for June 14th disarmament action. Participants were arrested at civil disobedience along with 1600 others.” NJA Newsletter #10, Summer 1982. Photo by Jacob Bender.